This Situation Update describes events occurring in Bilin Township, Thaton District during the period between August 1st to October 31st 2014, including militarisation, the situation of the Karen National Union (KNU), development projects, and the situation of non-governmental organisations (NGOs). Villagers mainly work on hill and paddy fields. The time for them to start ploughing and planting the paddy has arrived however there was an abnormal amount of rainfall outside of the rainy season, and because of this their paddies did not grow well. Some are faced with the difficulty of having to go to Bangkok for work. In Bilin Township, the Karen National Union (KNU) set up a clinic which gives prenatal and postnatal training to midwives who come from many different villages. In Lay Kay village, the villagers said if they have disease, they have to go to Burmese Tatmadaw soldier health workers because the KNU clinic is very far from where they live. In Lay Kay village, the Burmese Tatmadaw military are repairing their army camp. During this year’s repair of the camp, they cut down villagers’ trees, bamboo and thatches for their military use. The following Situation Update was received by KHRG in November 2014. It was written by a community member in Thaton District who has been trained by KHRG to monitor local human rights conditions. It is presented below translated exactly as originally written, save for minor edits for clarity and security. This report was received along with other information from Thaton District, including 12 interviews and 72 photographs. I am going to report about some townships and the situation of the villages that are in the area [Bilin Township] where I have been located from August 1st to October 31st 2014. The situation of the [Tatmadaw] military, the KNU [Karen National Union], development projects, and of NGOs [non-governmental organisations] is stated below. I am going to report about the livelihoods, healthcare, education and the relationships of the villages that live in the area. Most of the villagers’ livelihoods consist of working on hill and paddy fields. It is the time [of the year] for them to start ploughing and planting the paddy. A month after the initial planting of the paddy is when it should start to grow. Lay Kay villagers said that since there was an abnormal amount of rain outside the rainy season, the snails ate their paddies, some paddy plants died and some did not grow well. On October 24th 2014 and onward, it was time for harvesting, however since they did not get much paddy, the villagers face difficulties. Some of the villagers have planted rubber trees, however they have heard that the market price of rubber has decreased, which causes them difficulty. Some of them have gone to Bangkok to work. There are now few youths in our area. Some of the youths who go to work in Bangkok can send money to their parents and some of them cannot. In terms of the healthcare sector, as it is the beginning of the rainy season and the weather has changed, [some of the villagers are suffering from] colds and fevers. They go to treat [their conditions] in the clinic which was set up [in the village] by the KNU. The health workers at the clinic stay in the clinic. The KNU give pre and post-natal training to midwives who come from many different villages. Villagers generally give birth in the village. In Yoh Klah village, the Burmese government set up a clinic for the villagers but the government health worker who is going to take care of the villagers does not want to live amongst the Karen people. I heard from the villagers that she said that if she is given the responsibility of injecting vaccines [for the villagers], she will come and inject the vaccine and then she will return to her village. In Lay Kay village, the villagers said that if they have disease, they have to go to Burmese [Tatmadaw] soldier health workers because the Burmese [Tatmadaw] army camp is close by, whereas the KNU clinic is very far. There is a Burmese [Tatmadaw] military clinic in the village. Although they do not ask the villagers to pay for the medicines [as it is free for the villagers], the villagers do not want to go [to the Tatmadaw military clinic]. As the KNU cannot come to set up a clinic in the village, they [villagers] have no choice and they have to go to the Burmese [Tatmadaw] military health workers. The villagers said that when we go to their clinic, they do not ask us to pay for the medicine, but if they do not have the medicine [that we need], we have to buy [the medicine] outside [of the camp]. They never have enough medicine in their clinic. In terms of the education sector, I can see now that it has improved a little bit since the situation is getting a little bit better. I see that high schools are being set up and most of the nursery school teachers are from women organisations, the village, or Karen Baptist missionaries. Since there are more nursery schools, I heard that the villagers said that our children are able to go to school. The mothers are able to help their husbands at home more. The Burmese government primary schools are in Yo Klah village, Htee Hpah Doh Hta village, Lay Kay village and the villages that go down [lead] into the town. I see that [when the children] finish their primary school, they have to go and stay in other villages [to continue their education]. When they finish four standards [grade five] which is primary school, they have to take a government examination from the Burmese government school or KNU high school. However, if they take the government examination from a KNU school, it is difficult for them to get a recommendation for a school transfer when they move to another government school. If the students from the hill land area [mountainous areas] go to take the examination in the Burmese government school, it is very far. They therefore have to take the examination at the KNU government high school [in order to continue their education]. Most of the students go to the KNU high school because they are ordinary people [without much money]. Now, as Karen Baptist missionary teachers are around to help the villagers, they [the villagers] are able to send their children to school as the schooling is free, whereas before they had to pay. There are, however, also many children who have not gone to school yet. In terms of the Burmese [Tatmadaw] military, I see that in Lay Kay village they are repairing their army camp to make it better. During this year’s repairs, the villagers said that they [the soldiers] have cut down the villagers’ trees, bamboo, and thatches [trees that villagers use to make thatching for their roofs]. As it was too late when the villagers saw [them cutting down their trees, bamboo and thatches], they could not do anything about it. I heard, however, that some villagers said that when they cut down the bamboo it is not only for [repairing] their camp. After they cut down the bamboo, they split it into pieces [secretly] so that no one knows that they [the soldiers] are selling them. After they split the bamboo, they sell them in the town. The villagers and the village head have complained to them, but they have just gone and cut down [the bamboo] in other places. The name of the column commander of the current Burmese [Tatmadaw] soldier group who are staying in Yoh Klah village is Thu Rein. The villagers said that [he] always goes to a house which is outside of the village to drink alcohol every night. I do not know what kind of plan he has. The name of their corporal is Kyaw Hsan. He travels to every village in the area. The villagers said that he asks for money from the people who trade in the black market. Moreover, he asks permission from his column commander to go to Kwee Lay village which is near to the [KNU] township office and he does not ask permission from the KNU leader. He asks permission from his captain and if his captain gives him permission, he goes. If his captain does not give him permission, he will not go. The villagers said that since he travels like that [without the permission of the KNU and to wherever he wants], they worry that there will be fighting [between the KNU and Tatmadaw]. The group of soldiers who travel like this in Yoh Klah village is Light Infantry Battalion (LIB) #4 (Kyaikto Township) which is under the control of Light Infantry Division (LID) #44. In terms of the KNU, in Ka Wa Hta and Htee Maw Hkee villages, I heard some villagers saying that the KNU and some bosses [rich people] are trading logs. If we look in terms of the side of the Burmese soldiers, the villagers said that as the Burmese soldiers who stay in Yoh Klah village have gone to other places, the villagers are worried that fighting will happen between KNU soldiers and Burmese soldiers [if they meet]. In terms of NGOs, on October 23rd 2014, I arrived at Noh Ka Neh village and I saw an NGO conducting a development project [constructing a school] in Noh Ka Neh village. 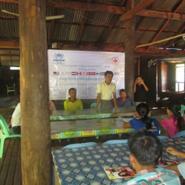 They met with the [Noh Ka Neh] village head and village elders on October 23rd 2014. 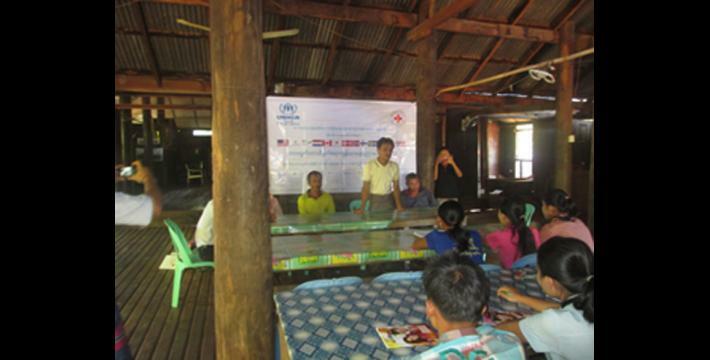 The name of the organisation is SDC [Swiss Agency for Development and Cooperation] and the name of the person who came to look for the place and met and interviewed the village member in charge is Saw Min Naung. On November 25th 2014, I arrived at Lay Kay village and I saw that United Nations High Commissioner for Refugees (UNHCR) has come regarding the healthcare in the village. They gave [healthcare] training for three days and had a limit of 15 trainees. Each of the trainees is given 2,000 kyat (US $1.95) per day. The name of the trainer is Kyaw Swa Ko Ko Oo. Then I came back to Kyoh Weh village and I met and interviewed with the village head and some village elders. They [village head and village elders] said that the people from the NGO [SDC] who were conducting the development project said “Tell us the most important [thing] in your village and it will be solved for you.” Kyoh Weh villagers requested a school but they were given a water supply. In terms of the water supply, the villagers wanted them to dig the wells at the center of the village, but they dug the well [for the villagers] near the river. This organisation arrived on April 19th 2014. [On] April 20th 2014, they built two water restoring houses and dug a well. The villagers were not satisfied with this. The information that I mention above is my opinion and my understanding of what the villagers have told. A Corporal commands one section. A section is a basic unit and is comprised of 10-11 men. For more information on NGO activity in Thaton District, see: “Thaton Situation Update: Bilin and Hpa-an Townships, June to November 2014,” KHRG, February 2015; and “Thaton Situation Update: Hpa-an Township, January to June 2014,” KHRG, February 2015. All conversion estimates for the Kyat in this report are based on the February 9th 2015 official market rate of 1,028.10 kyat to the US $1. The researcher does not write the completed acronym of the organization which should be SADC. water restoring house is asmall structure containing a water pump.